This bout with shingles has me doing something I swore I would never, never, ever do. I have been reduced to eating TV dinners! (Picture head hanging in shame.) I have no appetite and less energy and the thought of cooking even the simplest of meals it just too daunting. 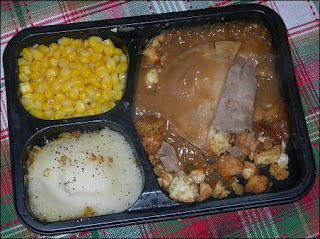 My question.....is there such a thing as an edible TV dinner? I am not expecting much. Just something that resembles what is pictured on the box and does not look and taste like cat food on the plate. There seems to be a tremendous demand for this stuff, judging from the freezer sections at the supermarkets, so you would think that some of it must be more palatable than the samples I have tried. Salisbury steak..... a nice juicy little hamburger patty with mashed potatoes and a small serving of corn. Reality.....a chunk of some sort of spongy mystery meat. The potatoes are usually OK and corn is corn. So I had mashed potatoes and corn for dinner. Chicken pot pie....golden and yummy-looking, with a little sauce oozing out of the crispy pastry topping. Reality.....a puddle of white sauce with a few coins of under-done carrots and a pea or two, and here and there cubes of some sort of white (and spongy) substance that I guess is the advertised chicken. True, the pastry is nice and crispy but does not make for a satisfying meal. Swedish meatballs......I should know better. Sweet and sour chicken.....cubes of white-meat chicken, peppers, rice, some pineapple, just the ticket for a light meal. Reality....what do they do to that chicken to turn it into inedible chunks of sponge? I know I keep using that word, but it is the only one I can think of that describes the texture and taste of this stuff. It does not resemble chicken in the slightest way, just as the slab of "Salisbury steak" had no relation of any hamburger patty I have ever eaten. The shelves are full of packaged dinners, just waiting to be reconstituted with a little water in your microwave, and the freezers are jammed with frozen dinners of all sorts. Surely, among them there must be some choices that are acceptable? Not as a steady diet, but just as a stop-gap to get one over the rough spots. Any suggestions, dear friends? Oh dear, I wish I was there to bring you dinner. I have not had much demand for frozen dinners, though Scott likes the Marie Callendar's pot pies. Maybe a can of Progresso soup instead? to me because they are mostly broth. 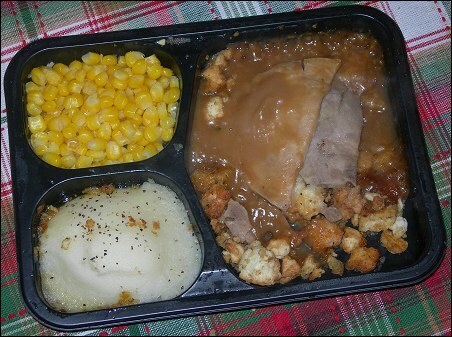 But I am still puzzled by the frozen dinners.....if so many people eat them, why aren't they better? Has our national taste descended so low that people really think they are acceptable food? If so, the country is in worse trouble than we think! On the bright side, I had a delicious BBQ'ed dinner at Dave's last night. But food just isn't high on my list right now. Mostly eat because I should. Ensure fills in when all else fails! Enough sniveling! When are you coming down? May bring Jamie down the weekend of August 20 -- will need to confirm though!